HoB fans and previous visitors will know that when we get a holda something we think is truly great; we do our darndest to make sure it gets the big-up and attention it deserves. A solid example of one such find can be found in the flippin’ brilliant PORCELAIN: A Gothic Fairytale. HoB fans and previous visitors will also know that we’ve mentioned this title and indeed, the creative band of boys and girls who produced this gem outta their publishing company Improper Books. This post is a little different, though. A bit of a level-up from our other features on the team and their work as this time around, we’ve been lucky enough to get an early, sneak read of PORCELAIN before it hits, takes over and vanishes from the shelves in a coupla days. The very fact that you’re here tells me that this book has caught your eye already and rightly so. Chris Wildgoose puts lines on pages in a way that create and represent some of the most beautiful characters and landscapes I’ve seen in comics or even under the broader umbrella of ‘art’ in a very long time. Wildgoose’s style is perfectly suited to this real-yet-fantasy genre featuring explicit detail and a sensitive softness in perfect measure. There’s something extremely playful yet intensely accurate and human about the myriad expressions depicted on this folks faces as they emote through this story. After reading the preview of the book that we all managed to snag at Thought Bubble this year (and is still available online as a .pdf here) what followed were twists that even I didn’t see coming. I’m the annoying one in the cinema who tells you what’s going to happen next, even though I’ve not seen the film yet, and if I get it wrong, I’m not far wrong – although perhaps that says more about film and cinema these days than my story-predicting-ability! The preview featured the beginnings of a loosely paternal relationship between a middle-aged or elderly man and a young girl. I found this to be a very brave and bold move, given the state of current affairs and scandal surrounding some men of a similar age and pre-teens. However, this relationship is handled in the same way that it flourishes, delicately and sensitively. This is one example of where I thought I’d rumbled the baddy – and I couldn’t have been more wrong. This rather embarrassingly revealed the cynic in me and thus took a firmer grip of my interest and I felt a direct emotional response from the content. What follows is a tale so beautifully told, it feels like an old familiar fairy tale, passed down layers of generations to the present, excited audience. The bizarre and intricate subject matter is unveiled to the reader in such a way that it seems to grow completely organically from its roots in the preview. I can’t remember ever reading a fantasy story that seemed to flow so effortlessly and didn’t require a bit of hard work and sacrifice from the reader to make it to the next page – until PROCELAIN. 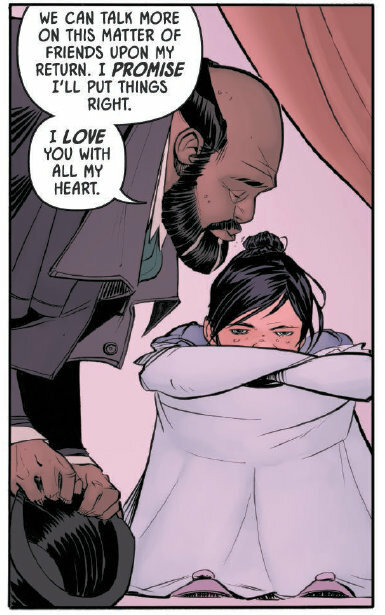 I can see Read’s Grimm inspiration, for sure but this story takes on a whole new depth and relevance, not least due to that delicate relationship between a male adult – Uncle and a young girl – Child. The book explores themes of loneliness, fragility, pain, love, heartbreak, hope, fear and I could go on. The paranormal and even superhuman threads that knit and interlock the events in this story are so real, so tangible and so human. Uncle’s form of gentle giant dwarfs the Child’s teeny, yet spritely frame and physique in both in perfect contrast to the sombre, almost skulking ‘creatures’ we meet as the story unfolds. Uncle’s threads are fur, silks and wools and Child’s are (later) laces and frills, in perfect contrast to the high-shine, clinical textures of the Porcelain. I found it incredibly interesting (that’s the Psychologist in me, coming out in HoBland) that I felt such empathy for protagonists with no actual names; simply ‘Uncle’ and ‘Child’. So well written and beautifully executed are the facets and complexities of the story; we don’t need their names. This book dragged me through every human emotion that I know to exist, and perhaps created a few new ones of its own. Upon reaching the bottom of the last page, I felt like I’d run and won a marathon. I felt so emotionally exerted, with a sense of great achievement and reward in equal measure. It is absolutely stunning. Even in in the dark, horror-tinted depth of my imagination, I didn’t guess what was around each turn before I got there, and yet the story fell wonderfully into sequence like a centuries-old fable. Read and Wildgoose bring beautiful human emotion to a cold, inanimate substance; both a metaphor for how this industry can sometimes be, but also a literal description of the graphic novel. I hope I’ve managed to do this gem justice without giving too much away. I want you to get excited about this book and love it, not fill you with spoilers! If your whistle has been suitably wet – and I trust that it has as you’ve made it this far, you can pre-order PORCELAIN: A Gothic Fairytale here. Or pop into your local Travelling Man as of February 27th! Have a look at the other treats on offer from Improper Books.